Have you ever had your cell phone ring, only you didn’t know where it is? The tiny electronic device could be anywhere in the house and you start running from room to room, standing to hear a ring, then scrambling, throwing pillows or clothes, as the phone continues to ring it’s ominous countdown before the “beep, beep, beep” that signals a missed call. Yes – it has happened to me once, or twice, or more. Ever since I installed the VTechn DS6421-3 Connect-to-Cell phone system, my days of searching for my cell phone have ended. For those that rely primarily on mobile phones but experience problems with spotty reception at home or have trouble hearing their cells from another room, the VTech’s DS6421-3 Connect-to-Cell™ systems is the solution. These phones can make and receive cellular calls, but offer the reliability of a landline phone. The VTech DS6421-3 Connect-to-Cell phone system is an innovative way to make using your cell phone at home about a million times easier. The system comes with three cordless handsets and an answering base station which you plug-in to your home phone line. 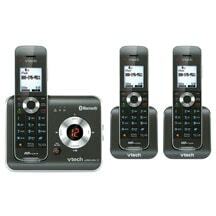 Setting up your cell phone to communicate with the VTech DS6421-3 is pretty easy. 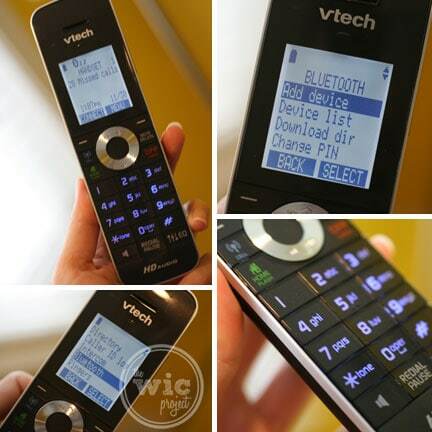 You navigate to the Bluetooth menu, then follow the steps to sync your cell phone with the VTech phone. Note that this connection only works with Bluetooth-enabled phones (which most phones are these days anyways.) You can connect two cell phones to the VTech Connect-to-Cell phone system. Once the connection is made, when someone calls your cell phone, your home phone will ring! 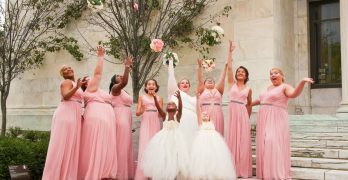 Since you can have two different phones connected, you can also set-up customized ring-tones for each cell phone and your land line. Even more, not only will your home phone ring when someone calls your cell phone, but you can actually use your home phone to make calls using your cell phone. Don’t have a home landline? You can STILL use this phone system to make and receive calls through your cell phone. 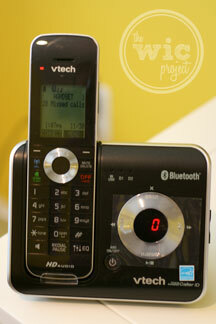 Another cool feature of the VTech DS6421-3 is the Push to Talk (PTT) functionality. Each handset has a PTT button on the side. Press the button down until the phone beeps and you will automatically be connected to the other handsets in the system. You can then begin talking and you’ll be heard on the other handsets. This is a great alternative to the intercom (which is also an option) since a voice from the phone saying “Dinnertime!” is much harder to ignore and doesn’t even require any yellling. I love the sleek and modern design of the phone. All of the buttons are flush against the handset, and have a blue backlight when any button on the handset is pressed. The up/down button looks like it might be a scroll with a button in the middle, but it’s actually just up and down, allowing you to easily navigate between all of the menu items or adjust your volume. After using this phone for a few weeks, I am quite sure it is one of the most amazing phone systems I’ve ever used. The cell phone connectivity alone makes it a winner, but it also comes packed with all of the must-have features, such as Caller ID (including Caller ID announcement, where a voice tells you who is calling), handset-to-handset Intercom, Push to Talk, and the ability to expand up to 12 handsets. Every phone call has had a crystal clear connection – whether a land line call or a cell phone call. If you would like to pick up the VTech DS6421-3 Connect-to-Cell phone system for your home (and really, for any home that has a cell phone, this would be awesome) then you can pick-it up online or in stores. It’s currently selling on Amazon for $78.86 and the VTech website currently has it on sale for $69.95! One winner will receive a VTech DS6421-3 Connect-to-Cell Phone System. I love that my home phone would ring even if someone is calling my cell phone. I love the push to talk feature the best! My house phone died, it would be ABSOLUTELY perfect if I won! I love that I can answer calls to my cell on the house phone — especially when I don’t always give out my house number and my phone is almost always low on battery! Im not sure if i leave a post here but i love this feature. It sounds like a great phone with alot of cool functionality. The push to talk feature is almost as slick as the look of the phone itself. I really dig the phone design…it’s got the JamesBondish feel to it. I like that it reaches up to 500 Feet!! Love the hands free handset speakerphones! I like that you can expandable up to 12 handsets using only one phone jack. I’ll make it simple. It has the best range of handsets. I also like that you can retrieve messages from handset. I like that all the services and features are integrated into an easy to use set. i love that you can pair four different cell phones (or headsets) and have two devices actively connected. Cellular calls can be made or received from either of the two active cell phones. Landline service not required, works great for cellular only households. that’s amazing!!!! Our phones are really old and one has a display that doesn’t work. I would love to replace it with these phones so I can have some good working phones. I love that there are Selectable Ring Tones. How cool is that?! 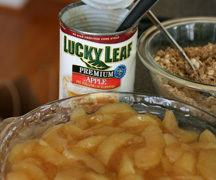 My favorite features are: Protect yourself from identity theft with digital security. Your call is digitized and encrypted, making it nearly impossible for someone to eavesdrop. and that it has excellent range, up to 500 feet. The fact that you don’t actually have to have land line service for it to work! My house is a dead zone for most phones, so this would be AWESOME!! I like that VTech supports RoHS initiatives by reducing the use of hazardous substances including lead, mercury and cadmium. I like the Intercom calling between handsets. I love the bluetooth feature! Lot of great features, but I think my fav is that I can access my cellular phonebook directory. I keep a lot of numbers in my cell phone and would not want to enter them all into any other devide. I love that you can connect with your cell phone. My fav feature is that you can make and Receive Landline and cellular calls with this phone! How cool is that? that you can connect with your cell phone. I love that Intercom calling between handsets. My favorite feature is that it doesn’t require you to have a land line. I like the Voice Announce Caller ID. I love the voice announce caller ID system. Saves me from having to walk to the phone to see who it is. The cell phone connectivity is but ONE favorite feature. My favorite features is being able to Transfer calls between handsets. the best feature is that it combines your two lines…cell and home. I like the fact that the DS6421-3 digitizes and encyrpts the call so people cannot listen in on your calls. I like that you don’t even need a home phone to use this. I like that you can protect yourself from identity theft with digital security. Your call is digitized and encrypted, making it nearly impossible for someone to eavesdrop. I like that it has 3 handsets. I love that it has selectable ringtones. I like the electable ring tones feature. We don’t have a home land-line phone any more, all cells so not needing a home phone is my favorite feature. I like the phone book directory…50 names!!! i like that it is hearing aid compatable. mom my could really use that. I love that you can download your contacts directly to the handsets. This is an awesome giveaway. My favorite feature is “Landline service not required, works great for cellular only households.” ヅ *Thanks* for the giveaway! I really like the Bluetooth feature. I like that you can Retrieve messages on the digital answering system from the handset. I like the PTT feature the best. 50 name and number phonebook directory…that’s impressive! Far more than the 15 that my house phone holds. I like that its hearing aid compatible. My fav feature is the obvioux one. You can use the handsets through your cell phones! We are a cell phone only household and this would be PERFECT for us! I also like that it is hearing aid compatable since one of my teen daughters has hearing aids! I like that you can protect yourself from identity theft! I like that the ds6421-3 lets up to 4 devices be paired up to the phone with two of them being active. I like the Bluetooth feature. My favorite feature is the “Voice Announce Caller ID”, that it announces the name and number of the caller on all of the handsets and base unit. No need to find the handset to see who is calling. Makes screening calls that much easier. I like the PTT feature- thats pretty convenient! 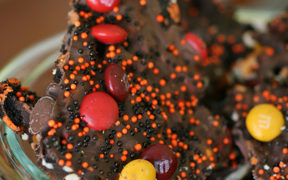 I can use this right now!!! I love the quality audio. Every phone I’ve had recently has really poor audio and that’s the most important part of a phone call esp. with 2 little kids making noise in the background, or not so background. lol 🙂 Also we love a phone in every room. Right now we have a 2 phone system, 1 for upstairs, 1 for downstairs. We could use at least 1 more. What I like about the VTech DS6421-3 Connect-to-Cell Phone System is that it connects to the cell phone, so that when it rings, the house phone rings. I like that it connects to your cell phone. I really love that I can use it with my cellular service. I like that it has digital security and speakerphone. I like the Last 10 number redial. I don’t have a conference feature, so I’d love this! My favorite feature is that you can use your cell phone number. I like how you can transfer calls from sets. I love how you can use the phones as intercoms that is awesome. I like that you can connect 2 cell phones to the set. The cell phone connection is awesome. LOVE TECHNOLOGY!!! Hmm… I hope I didn’t duplicate entries! My favorite feature is the HD Audio provides an extended frequency band allowing for the signal to be reproduced and tuned for a fuller and clearer sound. I like the blue blacklight. My favorite feature is the Connect to Cell. That would be so useful. Favorite feature is : Protect yourself from identity theft with digital security. Your call is digitized and encrypted, making it nearly impossible for someone to eavesdrop. Connect to CELL,I have been thinking about canceling my land line… this would be great. Facilitating me getting rid of my landline is amazing! I like that it is energystar compliant. I like the PTT button! Voice Announce Caller ID audibly announces the name and number of the caller on all of the handsets and base unit. I like the features like caller ID and that the system can expand. My favorite feature is the access your cellular phonebook directory – cool! I like that you can transfer between handsets. I like that it is an energy star product. I love that it announces who is calling. Really helpful when I have my hands full so it will announce who is calling so I can call them back later or know if its important. I love that it can pair four different cell phones (or headsets) and have two devices actively connected. Thanks for the awesome giveaway! First I would have to say the BLUETOOTH. How awesome is that to not have to use your cell phone all the time (I miss the feel of a regular phone) & the press any key answer would be a plus! I like the push to talk feature. Thanks!! I like that it has an Audio equalizer allows you to choose from 4 different profiles to best match your hearing. • Remotely retrieve messages on the digital answering system. i love that its Expandable up to 12 handsets using only one phone jack. I love that there are 3 headsets. I like that it has a 50 name and number phonebook directory. its a neat system, but a bit complicated to set up efficiently. 1) when talking on the phone, even with volume all the way up, it is hard to hear unless I push speaker button ? tryed several times to set-up answering system at base unit, with rings ess than cell rings, but, the base will not pick-up and take the mesage.